Dividing is splitting something into equal groups or parts. 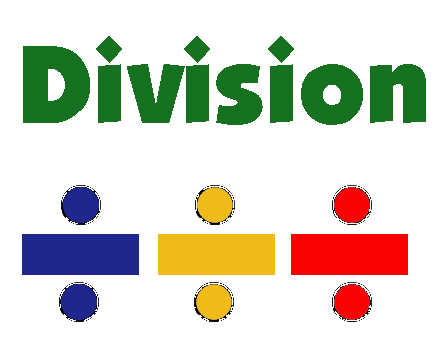 Division is a basic arithmetic operation just like multiplication, addition and subtraction. Division can also be defined as a calculating that how many times a number is contained with another one. Every child will get 4 candy if we split the candies equally. (÷) is the symbol of division. It can also be shown with (/). In division, special names are allotted to each number. Here 4 is the dividend 2 is the divisor and 1 is the quotient. Sometimes the division is not that simple, and the number is not divided perfectly. So the left over number or the remaining number is called remainder. Example: If we have to distribute 9 chocolates into 4 kids. 9 ÷ 4 = 2 and 1 is left. So that 1 left over chocolate will be called as remainder.